Dun-Dun: P. S. Durnken Dunning Comic. The one thing I miss about bazooka. Are my Comics. So with that in mind insparation struck and I came up with this. 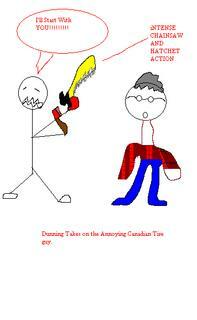 If your anything like me you hate that canadian tire family with a passion. So here now is a comic of the annoying canadian tire man in paint. Tuning in to politics for 2006, beyond Maybe I'm wrong about the public's interest in politics. Great Blog! If you have time see my ##business opportunities## related site. enjoy! It pretty much covers ##business opportunities## related stuff. Most affiliates just slap some Adsense ads on their blogs to try to generate revenue. So...I've noticed that there are a lot of these anonymous comments "advertising" things...Is that normal? Yeah. I was kinda wondering about the anonymous comments too. And thanks, Im glad someone enjoyed that comic. Yeah, comment spam seems to be getting everywhere. Doesn't Blogspot let you delete comments? And BTW, since you're not busy making any posts in recent days, how about sending me those pictures I took on your digital camera. I'm curious to see how they turned out.